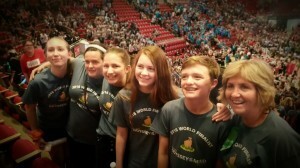 The Haddonfield Middle School Odyssey of the Mind “Aesop Gone Viral” team, coached by HMS teacher Lori Rue, attended the four-day Odyssey of the Mind World Finals Competition at Iowa State University in Ames, Iowa over the Memorial Day weekend. Having won their Regional Tournament and tied for second place in the New Jersey State Tournament, the team qualified to compete at the 37th annual Odyssey of the Mind World Finals among 800 top teams from around the country and the globe. 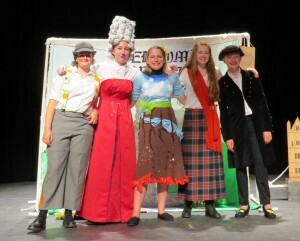 Team members were eighth graders Chloe Griffault, Emmaline Kenny, Lillian Leimkuhler, Gillian Rozenfeld and sixth Ryan Genel. The elements of the competition include designing a solution to a defined long-term problem, as well as preparing for a time-limited spontaneous challenge, where the team solves a given creative problem on the spot. Beginning in November, the team collaborated on developing a creative re-interpretation of a fable that has gone viral and is communicated through history in a new way. Specific requirements and restrictions also had to be successfully incorporated into the team’s presentations in order to achieve a winning score. The team, under the dedicated leadership of Coach Rue, continued to refine their presentation and problem-solving skills through multiple weekly meetings all the way through May in order to prepare for World Finals. It was an exciting event, culminating in a huge party on the last night to celebrate the hard work of all participants from around the world. Congrats to the team!